I woke up feeling it was Christmas day. Despite the night's sudden anxiety attack I was up and about by 6 am with a silly grin on my face. I wanted to savor the first day of my 30th year. 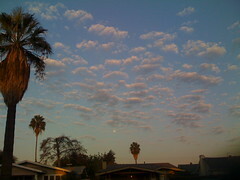 So I took my dog for a walk and I stopped to capture a view of the new day: diffused sunlight, cirrocumulus clouds, palm trees and the almost new moon.